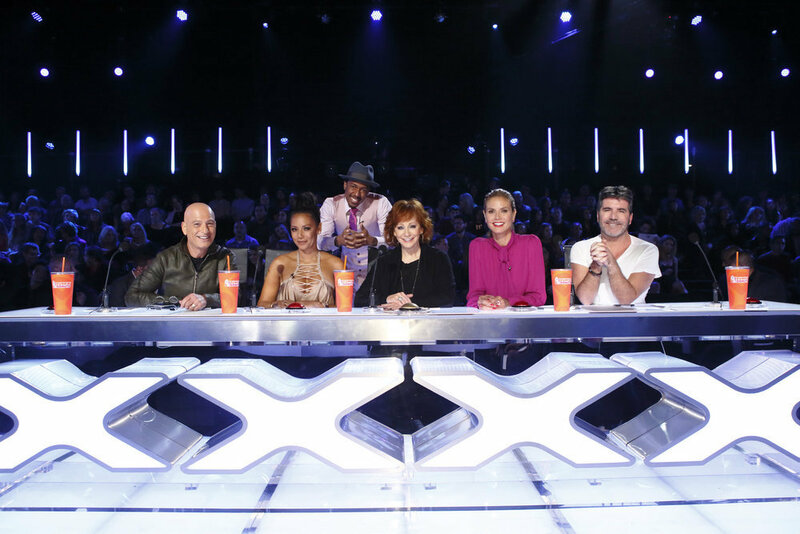 One of country music’s most iconic artists joined the America’s Got Talent judging panel for one night only! With 27 studio albums, 25 number one Billboard singles, 14 American Music Awards and two Grammy Awards, Reba McEntire has captured the hearts of numerous generations of fans with her superb showmanship and take-no-prisoners attitude. Tonight, the Broadway and TV star helped Simon, Heidi, Mel B and Howie find the latest acts to that were ready to take the Dolby Theatre stage for the Season 11 live shows and earn the $1,000,000 cash prize. Which contestant received Reba’s Golden Buzzer? Which acts advanced to the live semi-finals? Read on to find out! After Nick had given an inspirational speech to the gathered acts backstage, he introduced the audience and the judges to tonight’s guest judge: Reba McEntire! Kadie Lynn was shocked when she found out that she was going to perform in front of her hero. The 12-year-old Kemp, Texas native tackled Miranda Lambert’s “Mama’s Broken Heart” and her vocal performance set the bar for the night. Mel B liked her distinctive voice, while Reba loved her stage presence and told her that if she were coachable and gave it 110-percent, she would be a star. Simon added that he would personally fight for Kadie during the deliberation. Estonian contortionist Vello Vaher wanted to prove that age is not just a number for his Judge’ Cuts performance. He used his hands walking on the gymnastic equipment and showed his true strength when he tied himself by his legs and held himself up by biting on the zip line. Reba was in awe, but Simon stated that he would have a hard time describing his act. Reba and Simon each took down two groups of adult rappers, but 11-year-old rapper Skylar Katz hoped that she would avoid the buzzers. The young emcee delivered impeccable beats that blew the audience away! Howie stated that Skylar had the whole package, and Reba added that she liked her swag. While Mel B wanted her to let go a little bit more, Simon said that she was made for this competition. Another young frontrunner that faced the judges tonight was 14-year-old contortionist Sofie Dossi. She started her routine by taking her act aerial and performed impeccable tricks on a solo bronze ring. Next, Sofie twirled on one balance beam and shocked the audience. Finally, she brought out her trusty bow and fiery arrow and shot at the wooden AGT logo. Reba, Howie, and Heidi gave her a standing ovation, while Mel B stated that Sofie topped her first audition. When Simon asked Reba for her opinion, she said that “actions speak louder than words” and pressed the Golden Buzzer! With the Golden Buzzer gone, the remaining acts had to step up the plate. Moya Angela stepped on the stage and dedicated her Judge Cuts’ performance to her deceased grandmother. She sang Heart’s “Alone” and yet again, her spectacular voice gave me goosebumps from the very first note. Moya received a standing ovation from Howie and the ladies. Reba stated that she touched her heart and soul, Mel B added that Moya was a real powerhouse. Unfortunately, Simon said that he was slightly disappointed with this performance because Moya did not take any risks. 28-year-old Adam Grabowski took the stage and the Chicago native tried to make the audience laugh, but Simon buzzed him, and he continued to go downhill after he insulted Reba. Meanwhile, Julia Scotti returned to the AGT stage and brought her honest wit to her performance. She talked about fame, burial money, her family’s love of free food and her weight. Mel B loved her warm personality, while Reba declared her a “very happy person.” Simon added that she was very naughty and inappropriate. Last night’s magicians set the bar so high that I was wondering if any other magicians can deliver. Rubik’s cube magician Steven Brundage impressed the crowd with his brand of magic. He asked Reba to guard his Rubik’s cube, while he enlisted Heidi into a card trick and she chose the “six of diamonds.” He tore up the corner of the card, and he magically put the six of diamonds in the cube. Mel B stated “that’s ridiculous” and Reba said that he was an excellent magician. But, Howie questioned his showmanship and was worried if America would be bored with him. Mel B immediately snapped back at Howie and stated that his charm would win the country over. The danger acts concluded the evening and boy it was a mixed act. One act transformed their performance into the worst comedic routine in the history of AGT (all thanks to Heidi Klum’s dumb advice). Meanwhile, the Deadly Games’ deadly spinning board of death collapsed during rehearsals and they still wanted to do it. Their wild gamble paid off as their act went off without a hitch. After saying goodbye to Reba, the judges revealed who advanced to the live shows! Moving onto the Dolby Theatre live shows: Sofie Dossi (Reba’s Golden Buzzer act), Julia Scotti, Kadan Bart Rockett, Deadly Games, Vello Vaher, Moya Angela & Kadie Lynn. Next week, guest judges George Lopez & Louis Tomlinson conclude the Season 11 Judge Cuts! Skylar Katz was great- She really should have been picked as a finalist- I think because Reba McIntyre was a judge- they picked a country singer who was just okay. You havve touched some fastidious factors here.